her recent tour of Lofa, local leaders of the provincial town of Vahun said the road project has reassured them that the Liberian government is concerned about the welfare of all its citizens. They told President Sirleaf that the road has enormous impact on trade, health and education in their district during the short period since its reopening. “We are no longer forced to use Leone (the local currency of Sierra Leone) as the only currency for transaction here in Vahun because of this new road. We can now go to Foya, Kolahun or even Voinjama to sell our produce, buy goods and get back here without any problem.” Mr. Alpha Kamara, son of Vahun Paramount Chief, said when asked about the importance of the road. Addressing the people of Vahun at a brief intercessory service held in the St. Patrick Evangelical Lutheran Church to welcome her, President Sirleaf thanked them for patiently waiting on their government to deliver on its promise. She said that’s a mark of good citizenship. She told them her government has started the process of ‘taking-development-to-the-people’ but they need to start taking advantage of these developments to empower themselves. President Ellen Johnson Sirleaf concluded the first day of her 2014 nation-wide tour with a sleepover at the newly built Presidential Suite in Vahun, making her the first President of Liberia to do so and the second (following late President William R. Tolbert) to ever pay a visit to there. Vahun, the administrative center of Vahun District, is located on the westernmost front of Liberia, protruding deep into Sierra Leone. The district sits in one of the most mountainous parts of Lofa County featuring chains of hills and valleys, which makes road construction complicated and extremely expensive. 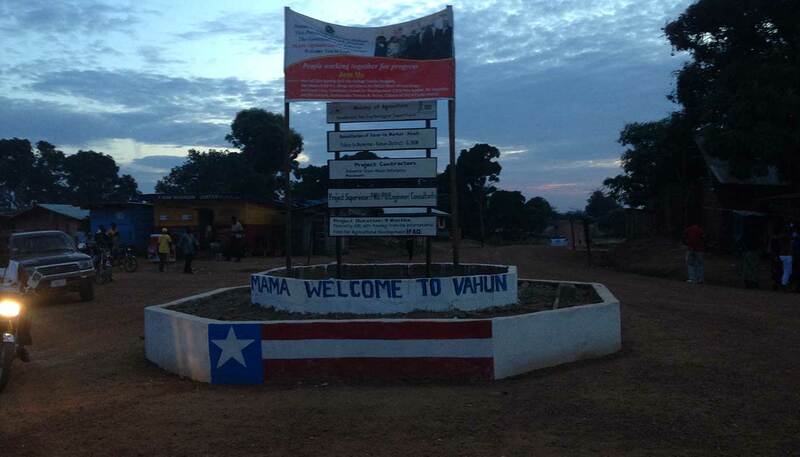 With about half of its land stretched into Sierra Leone, the long disconnection from Liberia due to the lack of road has led to Vahun being heavily influenced by Sierra Leone. Mande and Krio are the popular languages spoken by children in that bordering town. President Sirleaf acknowledged the social, economic, and cultural impact of their long period of interaction with Sierra Leone when she told them “…we know that Vahun has been considered part of Sierra Leone and that the Leone was the only currency in use here, but I’m pleased to know that because of this new road Vahun is now back in Liberia…”. The people of Vahun later appealed to President Sirleaf to push for the rehabilitation of the alternative Bomi-Gbarpolu route to Vahun. According to some members of the Lofa University Students Association (LUSA), the Gbarpolu road is a shorter route that gives farmers the option to get their product to Monrovia and other parts of the country quicker. Vahun is rich in gold, diamond, cocoa, coffee and timber. The forest is Vahun is amongst the largest in Liberia. Farming is the primary activity of the people in this region.